The setting for Summer Camp 2017 was Trenoweth Farm, down on the Lizard Peninsular. Those who have been around a few years will remember our previous excursion to the Lizard, and we can safely say that Lizard 2017 was nothing like this previous trip. Arriving at Camp the minibuses were met with a panoramic view of the sea, and tents gleaming in the sunshine. Apart from the day of hackey competition (naturally), the sunshine persisted for the vast majority of the 2 weeks. The programme was filled with old favourites: hackey, crocker and football competitions, the sleep out, Sunday workshops and chips at St Ives, but added in a fantastic athletics competition and watersports day. The options day returned successfully, with golf, St Michael’s Mount and Tour de Lizarde (cycling… obviously) amongst others. Some concerns over whether those on the Bushcraft option would be able to survive in the wild following tuition received, but at least some good stories came of it. On the ‘Tour’ we explored the off-road trails in the woods around Helston, stopping for lunch and icecream in Porthleven. 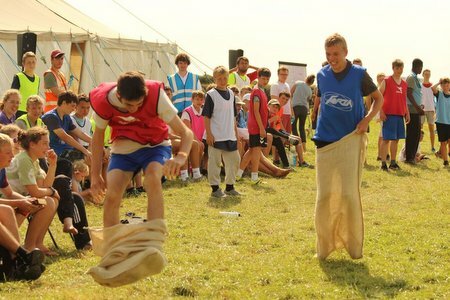 After the one-weekers had left, the athletics competition was a great opportunity for the remaining lads to mix between tent groups, competing against each other in sack races, three-legged and relays. Some inspired commentary from the team of Stan, Tufty and others, and a lot of laughs. 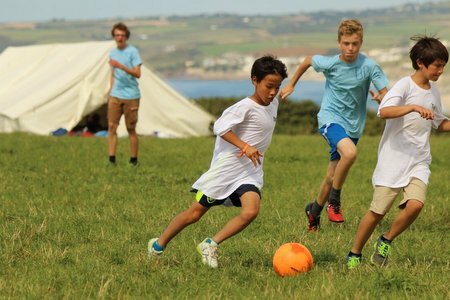 Although Lizard has clearly proven itself a fantastic Camp location, we hope that you will join us for Summer Camp 2018 when we return to Polzeath. Finally, recent visitors to the the USG Hall will have seen that a number of photos from Camp have been mounted around the place, and the Camp video has been shown on a Friday night. We also hope to be able to load this here shortly.